I know that war memorials were a bit hit and miss after the First World War - there was no centrally organised list in Barnsley for example, although there were moves in 1923 to collate one. Over the past few months myself, GB and JA have been photographing and transcribing war memorials, memorial tablets and any other memorials to the First World War that we can find in the Barnsley area (modern day boundaries). Some names jump out at you from the listings as you transcribe them, or even when you see them on the memorial as you photograph it. 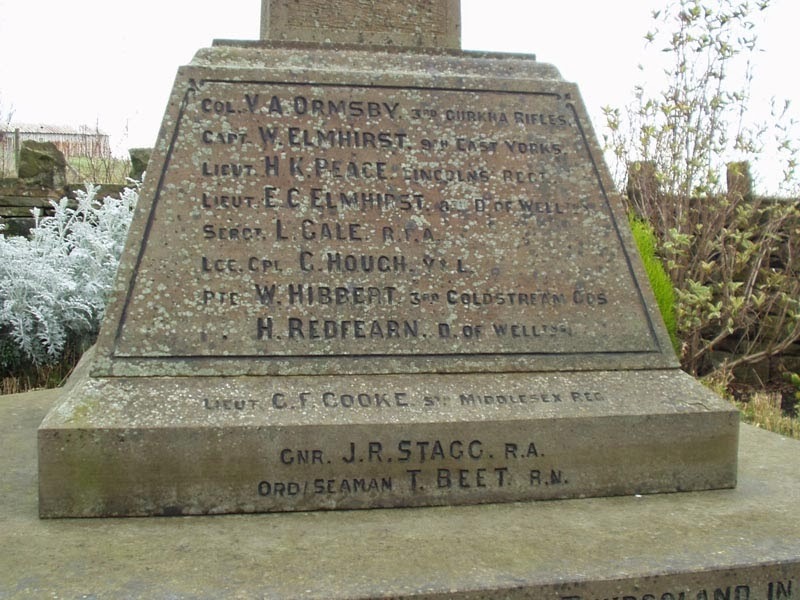 This happened to me yesterday in Thurgoland and I seem to be running myself in ever decreasing circles trying to understand how two men whose family seat was in Worsborough could be remembered on the memorial at Thurgoland. The names were Captain W Elmhirst and Lieutenant E C Elmhirst - both these names also appear on the memorial at St Mary's and on a family plaque in the church as well. The Reverend W H Elmhirst was born in 1856 in Gainsborough, Lincolnshire. He was the son of William Elmhirst, born 1827 in Barnsley. There is an old farmhouse still called Elmhirst opposite Mount Vernon Hospital which was their family home. The elder William Elmhirst became the chaplain of Stainborough, he died in 1899. William Heaton Elmhirst married in Felkirk in 1890 to Mary Knight. They had one daughter and eight sons. Two of his sons have their own entries on Wikipedia. William Heaton Elmhirst was the vicar at Laxton, Yorkshire, from 1892 to 1905. He inherited the estates from his father in 1899 and appears to move back to Barnsley after 1905. In 1911 he is living at Pindar Oaks with his daughter, his wife is away from home staying with her brother along with their youngest son Alfred. Their other sons are scattered all over the country at various boarding schools. William and Ernest were away at school in Malvern. James and Richard are in Matlock. Lieutenant Ernest Christopher Elmhirst of the 8th Duke of Wellington's Regiment was killed at Gallipoli on 12 August 1915 aged 20 years. 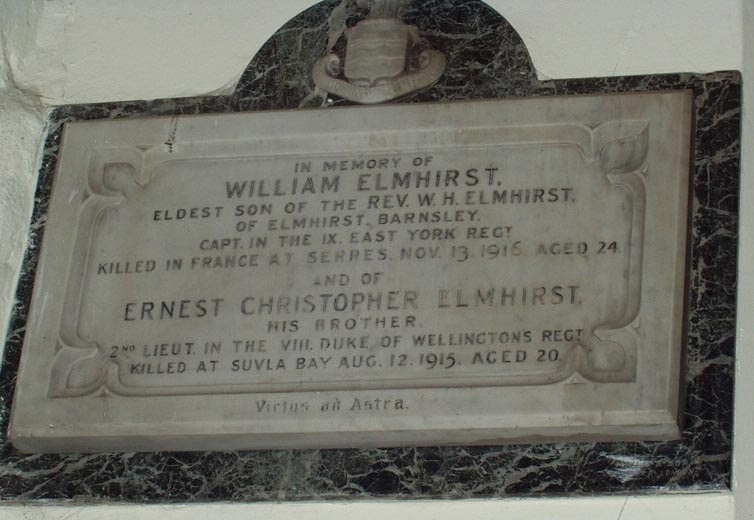 Captain William Elmhirst of the East Yorks Regiment was killed in France on 13 November 1916 aged 24 years. Leonard Knight Elmhirst and his wife Dorothy founded the Dartington Hall Trust in 1925. Thomas Elmhirst served in the Navy and Air Force and became the First Commander in Chief of the Indian Air Force. James Victor Elmhirst served in the 3rd York and Lancaster Regiment in the First World War. Richard Elmhirst - may have become a farmer. Alfred Octavius Elmhirst qualified as a solicitor and took over the running of his father's estates. Irene Elmhirst married Captain George Barker in 1935. (from Find My Past - Newspapers). William Heaton Elmhirst died in 1948, having outlived two of his sons by more than thirty years. Nothing in the research I have done today suggests any reason why his sons are remembered on the Thurgoland War Memorial. They weren't born in Thurgoland, they didn't live there, they aren't remembered on the memorial plaque or Roll of Honour in Thurgoland church, so it's not a connection via their father. I'm baffled. I have been researching a family in Barnsley for a university art project and have found some great information on your blog. I wonder would it be possible to ask you some questions?